Just 2 months after Macbook Air was announced in Macworld 2008, Apple has something new again to show the world. As promised, Steve Jobs announced the availibilty of the IPhone Developer Program and the Software Development Kit (SDK). The iPhone SDK includes the Xcode IDE, Instruments, iPhone simulator, frameworks and samples, compilers, Shark analysis tool, and more. 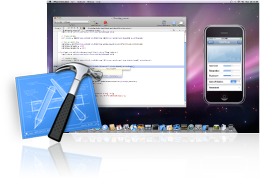 With the free iPhone SDK you can get started developing your application for iPhone. Access the iPhone Dev Center and dive into a wealth of resources including videos, sample code, technical documentation, Coding How-To’s, and more. What is IPhone Development Program? The iPhone Developer Program provides a complete and integrated process for developing, debugging, and distributing your free, commercial, or in-house applications for iPhone and iPod touch. Complete with development resources, real-world testing on iPhone, and distribution on the App Store, you have everything you need to go from code to customer. In simpler terms, the iPhone Developer Program lets you gain access to test your code on iPhone and distribute your free and commercial applications on the App Store. However, it’s currently only open for a number of developers in the US and it’s not free. The cost is currently set to $99 for Standard Program and a $299 for Enterprise Program.